↑ "City of Prime Ministers". Government of Uttar Pradesh. पहुँचतिथी 16 August 2014. ↑ Mani, Rajiv (21 मई 2014). 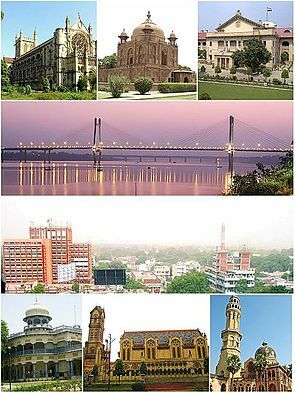 "Sangam city, Allahabad". टाइम्स ऑफ इंडिया. Times Group. Bennett, Coleman & Co. Ltd. पहुँचतिथी 16 अगस्त 2014. ↑ "Mayor of the city". The Indian Express. पहुँचतिथी 25 September 2012. ↑ "Census 2011" (PDF). censusindia. The Registrar General & Census Commissioner. पहुँचतिथी 25 June 2014. ↑ "Urban Agglomerations/Cities having population 1 lakh and above" (PDF). censusindia. The Registrar General & Census Commissioner,. पहुँचतिथी 25 June 2014. ↑ "Report of the Commissioner for linguistic minorities: 50th report (July 2012 to June 2013)" (PDF). Commissioner for Linguistic Minorities, Ministry of Minority Affairs, Government of India. प. 49. पहुँचतिथी 8 November 2015.